Television • Suit up! Producer and star talk TV critic into donning a suit of armor on set. Springville • Jason Faller and Kynan Griffin met at Brigham Young University, made short films together there, started making features after graduation and built a reputation for producing fantasy films — including five “Mythica” movies — on relatively small budgets. They have their own production company, Arrowstorm Entertainment, and they built a studio in an industrial park just west of Interstate 15 in Springville. It’s there that they produced much of the first season of “The Outpost” — a fantasy series that premieres nationally Tuesday on The CW. “It’s kind of crazy,” Griffin said. “He’s from Canada, I’m from South Africa and we’re making a TV show that will air around the world. The 10-episode first season of “The Outpost” went into production as sort of a spec series — no channel or network had agreed to license it. But the series was sold to Syfy internationally and The CW in the United States. It centers on Talon (Jessica Green, “Ash vs. Evil Dead”), the sole survivor of the Blackbloods — a magical race in a fantasy world. In a flashback, we see her as a child, traumatized when her friends and family are wiped out by a band of mercenaries. The adult Talon is determined to track down and kill the mercenaries and the fanatical religious dictator who sent them — and she learns she has a strange, supernatural power. It’s all very swords-and-sorcerers. Action and adventure. And lots of violence. With the exception of a week in Ireland, most of “The Outpost” was shot in Utah. Not just in Springville, but everywhere from St. George to the mountains of northern Utah, from the West Desert to lakes and rivers. (Photo: Scott D. Pierce/The Salt Lake Tribune ) The new series “The Outpost,” which premieres Tuesday, July 10, on The CW/Ch. 30, was filmed on a set in a Springville industrial park. The blue building on the left contains multiple sets for interior scenes; the Outpost exterior is on the right. (Photo: Scott D. Pierce/The Salt Lake Tribune) The new series “The Outpost,” which premieres Tuesday, July 10, on The CW/Ch. 30, was filmed on a set in a Springville industrial park. (Photo: Scott D. Pierce/The Salt Lake Tribune) The new series “The Outpost,” which premieres Tuesday, July 10, on The CW/Ch. 30, was filmed on a set in a Springville industrial park. And a few effects. When, midway through the premiere, viewers first get a glimpse of “The Outpost” itself, they’ll have no way of knowing it’s behind a security fence, next to other businesses, with cars parked out front and a cow pasture a few hundred yards away. That’s the magic of TV. In addition to casting Green, Faller and Griffin turned to one of their “Mythica” stars, Jake Stormoen (“Extinct”), and the 29-year-old jumped at the chance. He doesn’t exactly look like your stereotypical fanboy. Stormoen is handsome and athletic, and he’s way too tan to have spent a lot of time in his mom’s basement. But he’s definitely a geek at heart. “They molded all this armor for me. I went in for multiple fittings,” Stormoen said. And it proved to be “a bit of a godsend” when shooting began early this year. “It’s not insulated by any means, but no wind gets through it,” he said. The armor can get “a little toasty” when shooting indoors, however. And on a not-too-warm day in April, you could see armored actors and extras trying to keep cool while wearing costumes that look a lot heavier than they actually are. “It really does look like I’m wearing 60 pounds of steel, and it’s not close to that,” Stormoen said. “It’s all vacuum-formed plastic and leather. And, as was the case with actual, medieval suits of armor, the made-for-TV versions limit the wearers’ range of motion — which makes Stormoen feel more like a knight. “I love wearing it. I really do,” he said. Stormoen’s armor is custom-made, but there’s plenty to go around for co-stars and extras. Or when an executive producer tries to talk a TV critic into suiting up. “The article will not be complete without you in the full get-up,” Doug Pasko told me. I was reluctant. Because I look foolish enough in street clothes, and because I’m, uh, rounder than most people on TV. “I’m not a small person,” I said. But what kind of armor? There are all sorts of good guys and bad guys who wear different kinds in different colors. After a bit of a discussion, a decision was made. The costume department was rather amazing. Not only because the armor looks so good, but because they so quickly and capably managed to get a TV critic into one of the suits of armor, which required several steps and all sorts of strapping things on. And the end result was … both really cool and sort of silly. There’s a reason TV critics just write about TV. “You look great!” Stormoen said, proving that he’s extraordinarily polite. We posed for pictures; I looked like the “before” in a before-and-after advertisement. Except, of course, that Stormoen is the age of my children. Truth be told, the experience gave me an entirely different appreciation for the people who craft the costumes and the people who act while wearing them. 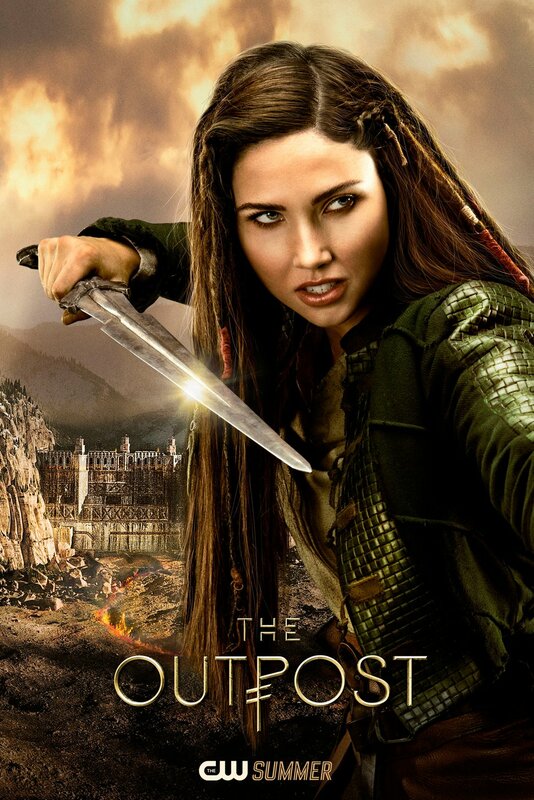 (Photo courtesy of Electric Entertainment/The CW) Jessica Green stars as Talon in “The Outpost,” which premieres Tuesday, July 10, at 7 p.m. on The CW/Ch. 30.